The wild mid-west joined us for our 7th Sales Representative Training this week! A great team of guys from REDCO Foodservice Equipment covering Wisconsin, Illinois, Minnesota, North Dakota and South Dakota, participated in our rigorous, hands-on 2 day training on February 6th and 7th. Todd Braun, Jarrod Deehr, Rick Zorko, Denny Stafl and Tom Krumsee made for quite an enjoyable (and entertaining) session! 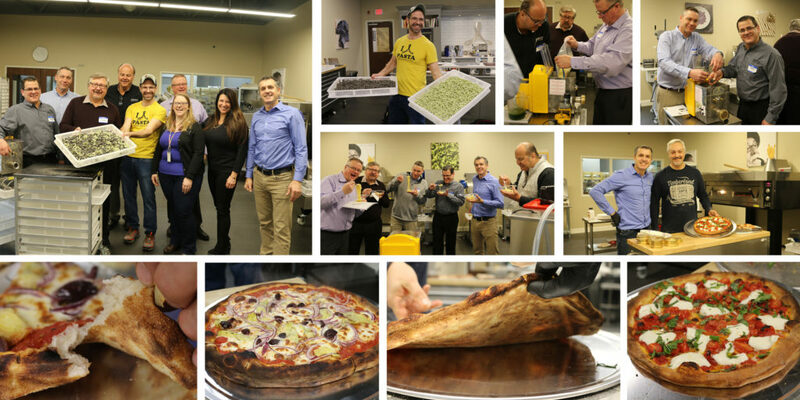 The training was focused on our complete Arcobaleno Pasta Equipment line – sheeting, ravioli making, extruding and cooking pasta as well as flavored pastas. Guest Pizza Master, Diego Puleo, crafted delicious pizzas baked in under 4 minutes with the Arcobaleno electric Pizza Oven. Squid ink and Jalapeño were the two choices of pasta recipes we chose! By adding these ingredients to the semolina flour, we created a subtle, yet savory flavor to the pasta! Of course, Chef Alex headed the dish and the finished product was delightful!